It was one of those grizzly grey days, pierced by hopeful spears of occasional sunlight that then fail to deliver any respite from the drizzle. 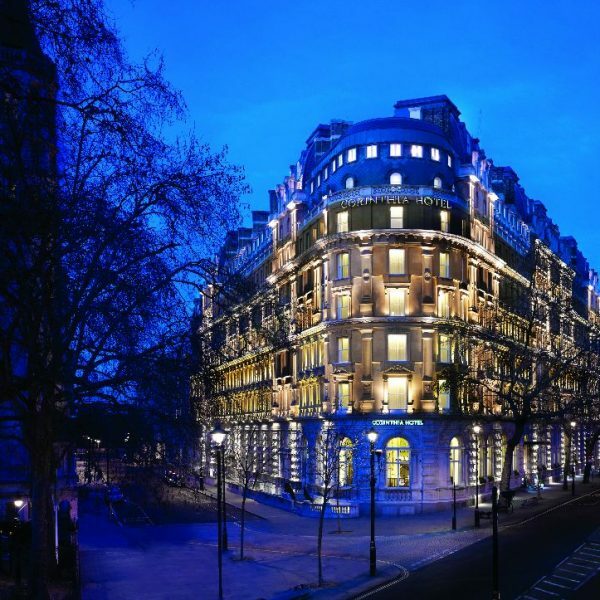 Charlotte and I traversed the – admittedly short – distance from Charing Cross railway station to the oasis of the Corinthia Hotel London, ploughing through dense clouds of identically dressed children and ducking under a veritable canopy of viciously spiked umbrellas. 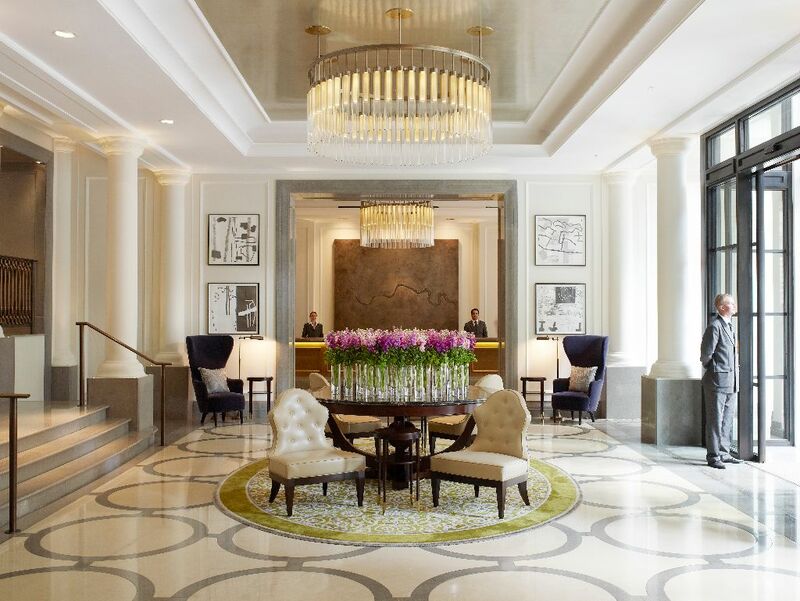 The spacious, elegant calm of the Corinthia’s reception area was wonderfully refreshing and we were quickly distracted from the crowded, damp London streets by trying to point out the landmarks on a Thames skyline in brass relief that meanders along the reception desk. The contemporary approach to art continues throughout the hotel, such as in the Lobby Lounge where guests enjoy afternoon tea under the watchful eyes of Claire Brewster’s ‘cut out’ map birds. Working with specialist Art Consultant Minda Dowling, the Corinthia has commissioned about 250 bespoke artworks and supports British contemporary artists with the annual Corintha Artist in Residence programme. This juxtaposition of modern art in the classically styled building provides an interesting environment for guests and certainly speaks of the care that is taken in every aspect of the hotel’s management. However, first impressions were overwhelmingly surpassed when we were shown to our accommodation for the night. 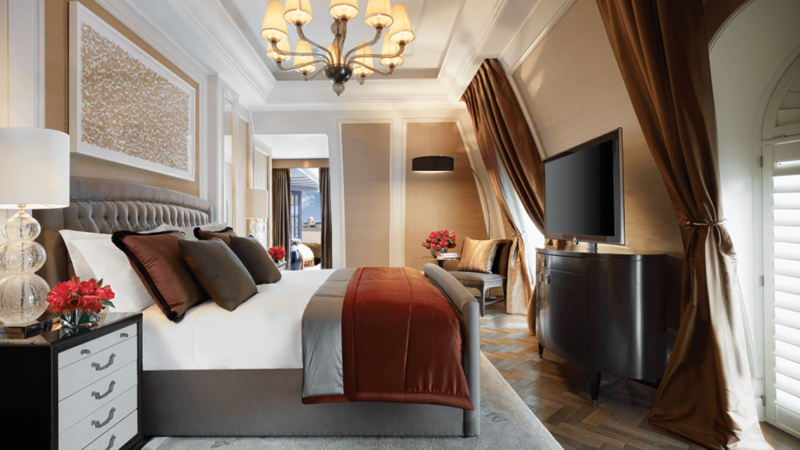 The Royal Penthouse has the grand dimensions and refined opulence of a modern palace. Upon entering, one is immediately taken by the height and space of the entrance hall, the centrepiece of which is a stunning and massive chandelier that hangs in the centre of the sweeping spiral staircase. From the entrance hall, one can easily reach the spacious living area with its far-reaching views towards the river, a butler’s kitchen, a jaw dropping mirrored dining room seating ten and a study that is a little reminiscent of a Bond villain’s control centre with three TV screens concealed behind leather panels. Naturally, in a duplex suite of this size and quality, there is a private, internal lift that takes guests from the entrance level to the upper floor, where there is a further sitting room – a cosy affair with comfortable, modern sofa – and two bedrooms, one with an ample ensuite and one with a bathroom of a size to rival the communal bathrooms of a mid-sized gym! The 2.2 metre Apaiser stone bath alone could easily fit three – although it wasn’t attempted on this occasion – while the his and hers sinks are spaced far enough apart that a water pistol would be required to splash one another! 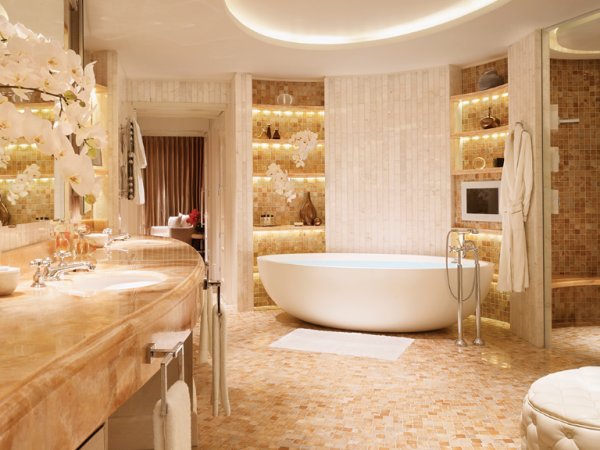 At the end of the master bathroom is a private spa pod, intimately lit, in which therapists from the Corinthia’s ESPA Life or one’s own staff can provide a number of treatments. With a 24 hour personal butler service provided to all the suites, Charlotte and I had not even the hassle of unpacking our bags and, leaving our lovely butler to hang our dinner dresses, managed to spend a good thirty minutes merely acquainting ourselves with the Royal Penthouse’s layout. 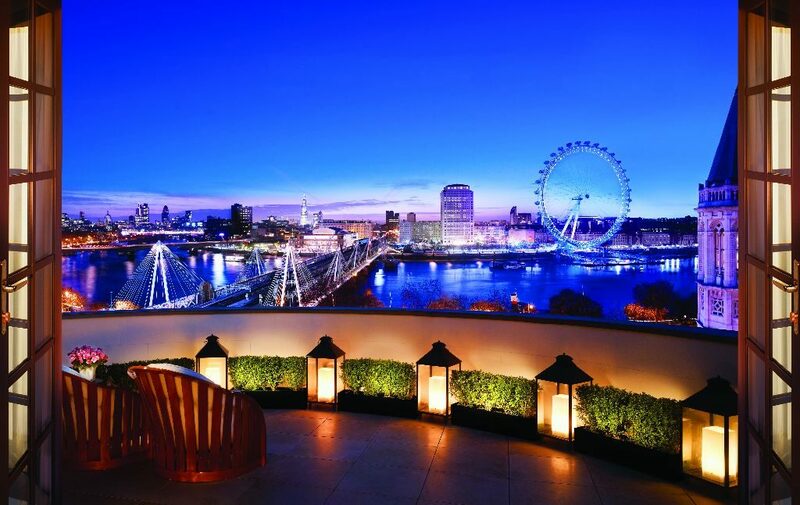 I was lucky enough to be the first to stumble across the terrace – a real showstopper in this already breathtaking Penthouse – with 180° views that take in a broad section of the Thames from the London Eye to Waterloo Bridge, the skyscrapers of the City looming tall behind. The terrace is enormous, quite big enough to entertain, with tables and chairs as well as sun loungers. Dusk being my favourite time of day, it was blissful to watch the twinkling lights of the city come on, with the anticipation of relaxed preparations for our dinner at The Northall. Returning to the Penthouse after post-dinner drinks in destination bar Bassoon, we found the lighting set to the perfect ambiance for evening, the scent of the Penthouse’s fresh flowers hanging in the air, and on our pillows individually boxed chocolates by William Curley. Both bedrooms are huge, with plenty of room to sit as well as sleep, although with so many other places to relax one is rather spoilt for choice. The beds were so comfortable that it was difficult to keep my eyes open once I lay down, even though I struggled to remain awake so that I might consciously enjoy the sumptuous surroundings for as long as possible. In the morning, we had breakfast on the terrace, where the bright, warm sunshine filled us with energy (along with piping hot coffee, pastries, and tasty eggs Benedict with crispy bacon!). It was truly one of the most luxurious hotel stays I have ever experienced. 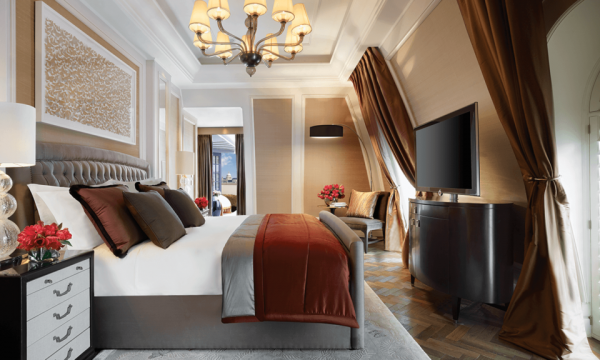 From the grey Marquino marble flooring in the entrance hall to the bespoke multi-room media system to the curated art collection, the facilities and atmosphere of the Royal Penthouse are perfect down to the last detail. Fortunate as we were to be given a tour of some of the other rooms, I can report that this attention to detail is present in each and every room in the hotel and, as if perfect accommodation wasn’t enough, the staff are all helpful and friendly, striking a perfect balance between politeness and familiarity. 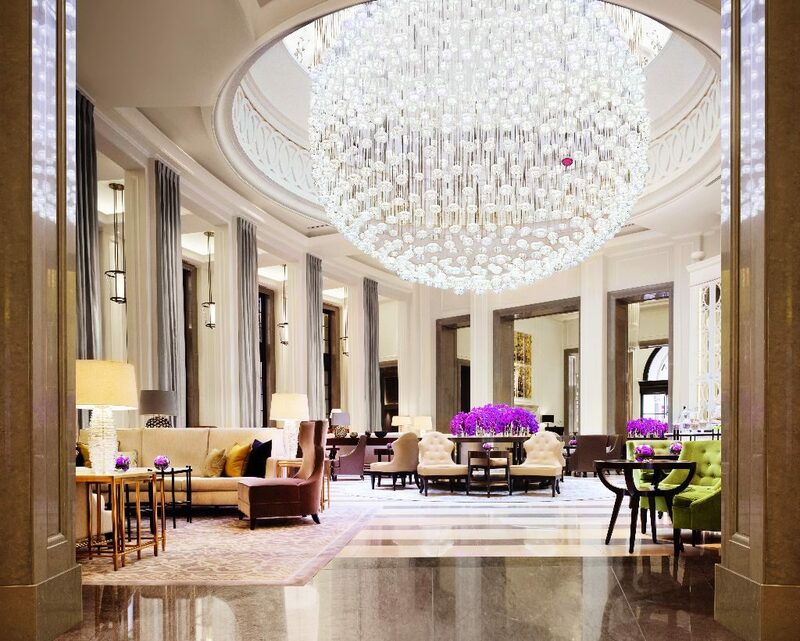 Corinthia Hotel London is one of the city’s finest hotels, with two top-end restaurants, three bars, world-class ESPA Life spa, Daniel Galvin hair salon and stunning function spaces including the Ballroom and the Courtroom. I could carry on detailing the extensive facilities, the chic fittings and unique modern-London charm, but you should visit and see for yourself! 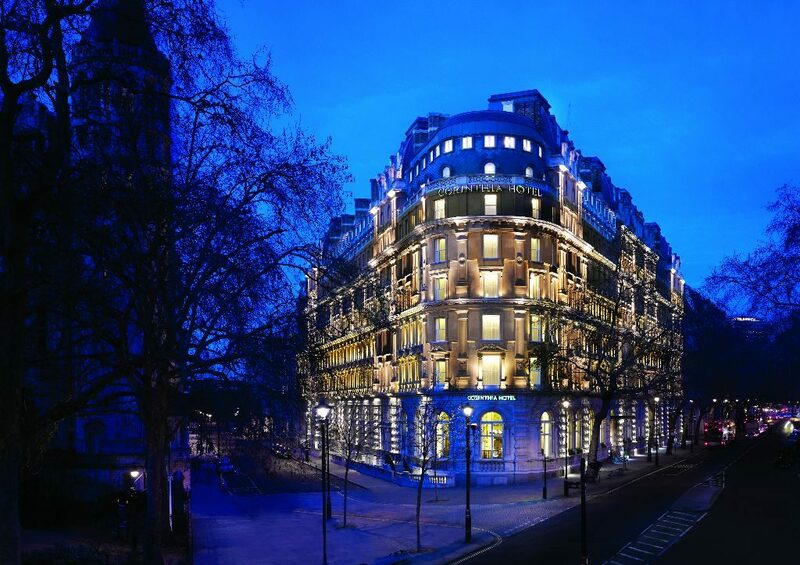 Even if the Royal Penthouse is out of your reach, the Corinthia Hotel London is a place that will make you feel lighter, as though your worries have been lifted from your shoulders, and replaced by the soothing hands of a talented masseuse of the soul. 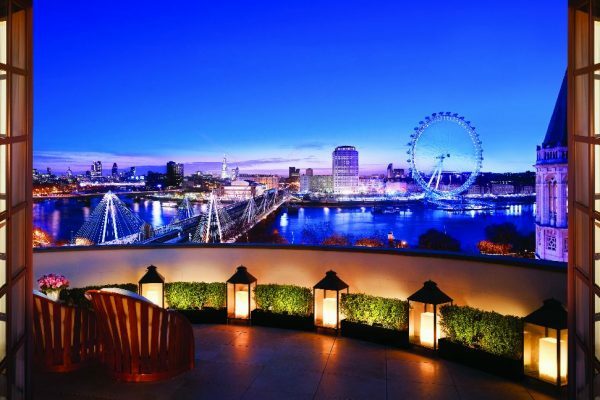 As we left the hotel, it was as though we were fluttering like butterflies in the sunshine over the terrace of our perfect penthouse; the whole of London stretched out before us and we were floating on air.